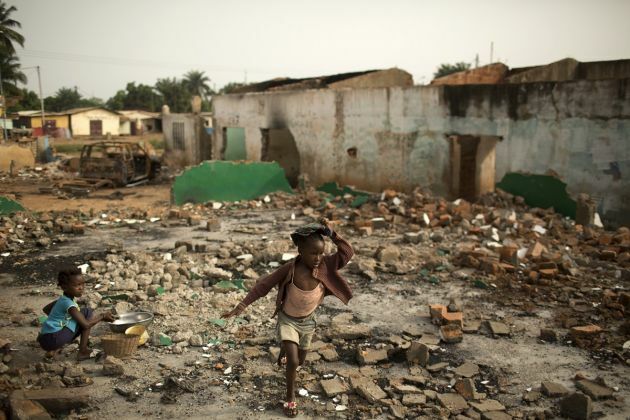 (PHOTO: Siegfried Modola)A girl walks through rubble of demolished Muslims homes in the district of Miskine in the capital Bangui March 5, 2014. GENEVA (Reuters) - Fewer than 1,000 remain of more than 100,000 Muslims who once lived in the capital of the Central African Republic, after a campaign of violence by Christian militias, the U.N. aid chief said on Friday. With 650,000 people displaced by the religious conflict, Valerie Amos said the United Nations had received much less than a fifth of the $551 million it asked for in December to provide food, medical care and shelter. "The demography of CAR is changing, from a situation where you had 130,000 to 145,000 Muslims in Bangui, to where you had around 10,000 in December," Amos told a news conference. "That number we think has now gone down to 900. So we have to act very rapidly." The Security Council on Thursday discussed a proposal for a nearly 12,000-strong peacekeeping force to stop the killing, but reached no decision. France is expected to submit a draft resolution within weeks, diplomats say, but the United States and Britain are concerned by the cost of a large force. France has deployed 2,000 troops to support a 6,000-strong African Union peacekeeping mission in the country of 4.5 million people but they have failed to halt the violence. "More troops are needed now to restore security and stabilise the country," Amos warned, adding that the deployment of a U.N. peacekeeping force would take at least six months. Some 290,000 people, most of them Muslims, have fled across the border into neighbouring countries. In the west of the Central African Republic, many towns have lost their entire Muslim populations in an exodus to the north. Human Rights Watch says tens of thousands have been killed since the Seleka, a coalition of mostly Muslim northern rebels, seized power a year ago and many of its fighters embarked on a 10-month campaign of looting, torture and murder. Since the departure of Seleka leader and interim president Michel Djotodia in January under international pressure, Christian "anti-Balaka" militias have stepped up reprisals against Muslims. "We have made suggestions, for example that we should be perhaps targeting three or four cities to try to stabilize those cities, to try to make sure that they retain a mixed population," Amos told a news conference in Geneva. With the onset of the six-month-long rainy season due in April, aid workers fear malaria and dysentery in makeshift camps like the sprawling settlement of cardboard shacks and tarpaulins beside Bangui airport, home to around 70,000 people. Efforts to bring humanitarian supplies to a desperate population are being complicated by attacks on aid distribution sites by armed groups as well as robberies and looting, Medecins Sans Frontieres said. On the road westward from Bangui, running through the towns of Mbaiki and Boda, villages and hospitals have emptied, U.N. human rights spokesman Rupert Colville said. In Boda, which lies 100 miles (160 km) west of Bangui, some 11,000 Muslims have been surrounded in four neighbourhoods by Christian militias. Colville said at least 80 people were believed to have died there in fighting which began with attacks by Muslims on the Christian population. Thousands of Christians fled, many of whom are hiding in the bush, waiting for Muslims to leave to return to their homes before the rains begin.